Proclear Multifocal lenses for presbyopia feature the innovative Balanced Progressive technology to ensure sharp vision at all distances. 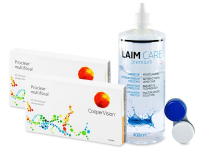 Each box contains two boxes of three lenses each and a 400 ml bottle of Laim-Care solution. Proclear Multifocal are monthly contact lenses manufactured by CooperVision for the correction of presbyopia. This very common eye defect begins to affect many people in their forties and is one of the natural consequences of the aging process.